SEPOR’s Fume Scrubbers are corrosion resistant pollution control devices designed for the removal or industrial fumes and odors, particularly acid fumes, chemical fumes and toxic gasses. They are constructed of poly vinyl chloride (PVC) for corrosion resistance, and are available in a variety of sizes to handle from 500 CFM flows up to a maximum of 60,000 CFM’s. There are two distinct design styles, the countercurrent, vertical packed tower wet scrubber design (capacities up to 12,000 CFM) and the horizontal, cross-flow pack wet scrubber design (capacities up to 60,000 CFM). 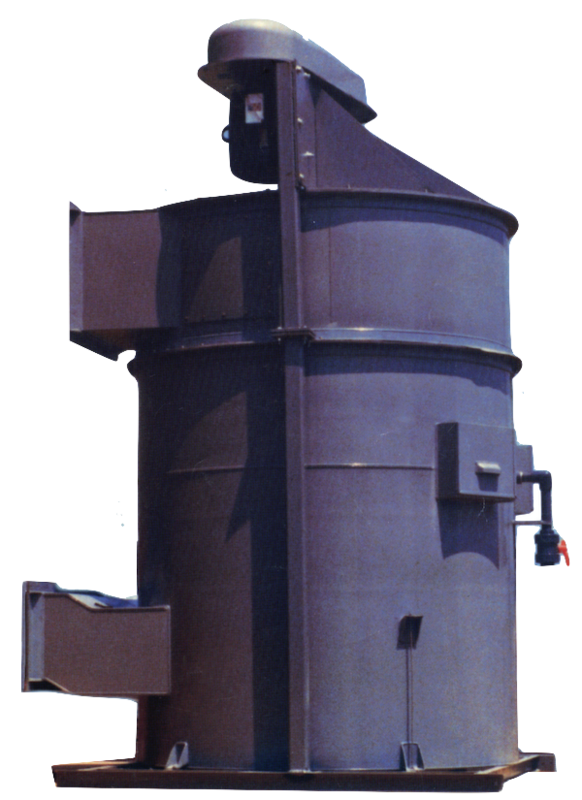 The countercurrent, vertical packed tower wet scrubbers are available in two models, the FW300 and the FW303. The FW303 contains an extended pack, to give a larger bed of pack media and greater scrubbing capacity for tough to remove fumes, like acid fumes. These fume scrubber units have an integral fan, eliminating the need for separate and space consuming fan housing, and duct work to the fan. These are the most economical fume scrubber models, ideally suited for air/gas flows of up to 12,000 CFM. Standard features of the fume scrubbers include fan, hollow cone non-clogging spray nozzles, corrosion resistant molded polypropylene slotted ballast ring filter pack media, PVC chevron blade mist eliminator and inspection doors for easy access to critical scrubber areas. Optional features include pH control packages with monitor, chemical feed pump and controls. Recirculation pumps are also optionally available for recirculation of all or part of the scrubbing water, as are pressure gages for measuring the pressure differential across the filter packing. Moisture extractors, for the removal of moisture near the fan outlet, are available for certain applications such as chrome or sulfuric acid fumes. Exhaust gas scrubbers are designed for specified collection and removal efficiency of air contaminants arising from the process as specified. Collection efficiencies shall apply to the unit as a whole, including mist eliminators downstream of the packing. 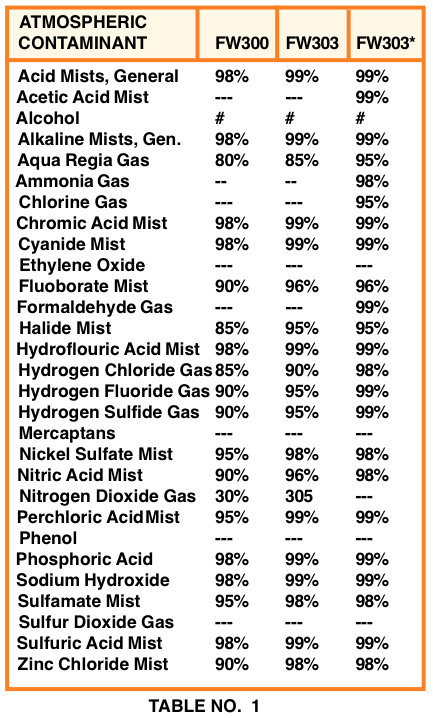 Overall mass collection efficiencies can be typically obtained from Table 1 (Contaminant Removal Efficiencies). The collection efficiencies shall be obtained with a scrubbing solution waste flow rate of not more than 0.15 gallons per minute per thousand (1,000) cubic feet per minute of gas flow, and pressure drop across the entire scrubber unit including the mist eliminator of not more than 2.4 inches of water column. Corrosion resistance of the scrubbers including all internals and appurtenances, shall be completely resistant to chemical corrosion from the process baths listed herein and shall carry a warranty against corrosion induced failure for two years after initial start up. The scrubber housing shall be constructed of Type II, Grade I, high impact polyvinyl chloride (PVC) conforming to ASTM D-1784-69 Cell 1433D. Each scrubber shall be complete with a corrosion resistant coated steel base of sufficient strength to make the unit self supporting when wet. All scrubber piping which is internally necessary shall be provided for recirculation of scrubbing solution such that the installer need only make a single external piping connection for scrubbing solution supply and return. Piping shall be polyvinyl chloride (PVC). Wherever possible, piping shall be installed at the factory. Interior piping is to be removable through the access doors for maintenance. Spray nozzles shall be open orifice, non-clogging type of sufficient quantity to insure complete coverage of the packing face. On horizontal scrubbers with pack depths in excess of two (2) feet, overhead weirs shall be provided in addition to spray nozzles to supply liquid to the packing. Recirculation pumps shall be of centrifugal type, and corrosion resistant. Pump motors shall be single speed, NEMA Design B, Class B insulated, 220 volts, 3 phase 50-60 hertz. All external pump and drive components shall be of corrosion resistant construction or otherwise epoxy coated. Pumps shall be securely mounted to a base. Pumps shall be sized to handle 50 feet of head on self contained, and 75 feet of head on remote recirculation systems. Remote recirculation tanks, if required, will be furnished, to be constructed of PVC. Fittings will be provided on the tank for pump suction, overflow and drain. Tanks shall be of sufficient capacity and structural rigidity for intended service. Tank freeboard above the overflow connection shall be of sufficient volume to contain liquid volume suspended in supply and return piping and scrubbers. Recirculation pumps shall be located on floor adjacent to the tank. Pipe and fittings necessary for connection of pump suction to tank will be furnished. Scrubber packing shall be resistant to corrosion from all contaminants listed herein. Packing shall be non clogging, non nesting and of such design and bed depth as to achieve certified collection efficiencies stated herein. Minimum surface area of packing shall be 44 square feet per cubic foot. A mist eliminator shall be provided that will eliminate 100% of entrained water droplets prior to leaving the scrubber. Access panels shall be provided for packing removal, spray nozzle and mist eliminator maintenance. Transparent view parts to allow for inspection of packing and spray nozzles are also standard. A flow meter for indicating the fresh water makeup will be furnished. Dwyer instruments Series RM, Model RMC, or equal that clearly indicates design flow on scale will be used. A pressure gage can be supplied to monitor the pressure differential across the filter packing. A Dwyer Instruments Series 2000 Magnehelic or equal shall be supplied, if requested. A pH control package can be supplied to achieve certified collection efficiency and minimize scrubbing solution waste dump rates. The pH control package includes a pH probe, controller/indicator, chemical metering pump and enclosure equal to NEMA 4. Contaminants are removed by first reducing the velocity of the fumes to below 500 feet/minute, during which time a percentage of the larger contaminant particles drop out. The remaining fumes then pass through a filter pack of polypropylene high surface, non-clogging packing media which is continuously wetted by spray nozzles. The fumes are absorbed by the scrubbing liquid enabling them to impinge upon the packing and be carried away in the wash water. After the fumes pass through the scrubber sections, the air is moisture laden and must pass through a two stage gravity mist eliminator section. In the final stage, PVC eliminator blades provide four (4) 30% air directional changes and eliminate entrained water as contact is made. All fume scrubbers may be supplied with water either directly from your supply or from a and integral or remote recirculation system supplied with the scrubber. It is generally recommended that a recirculation system be used to conserve water except on very low liquid requirements. The actual fresh water consumption on single pack series with recirculation is only 0.05 to 0.15 GPM/1000 CFM, depending upon the contaminant involved. On the extended pack models, water consumption ranges from 0.1 to 0.3 GPM/1000 CFM. This represents 5% of the water being recirculated. Our fume scrubbers are self draining and may be installed outdoors in subzero conditions without freeze-up. If these conditions exist, it is preferable that a remote recirculation system be specified for placement in a heated area. The top section of the FW300/303 fume scrubber consists of a centrifugal blower, complete with motor, OSHA belt guard and shaft cover. The blower section utilizes the same low maintenance, guaranteed corrosion resistance as applies to the rest of the unit. Little maintenance is required. Quick opening, easy access inspection doors at critical points minimize the little maintenance required. Every fume scrubber is shipped completed with an integral coated steel base. No special mounting is required. Simply connect the duct, the water and power supply and the unit is ready for operation. 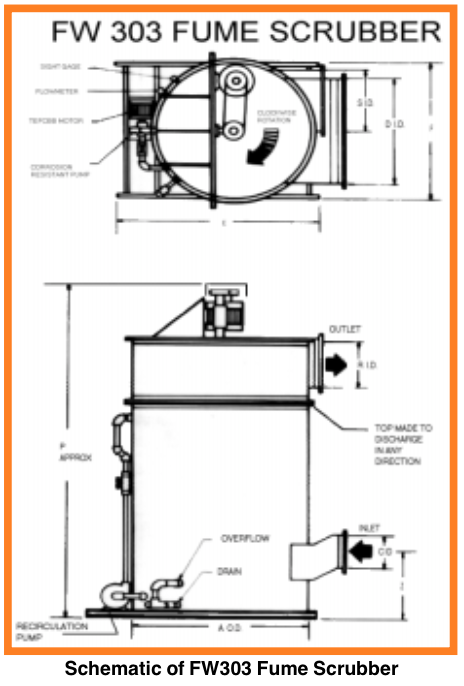 Complete installation and operating instructions are supplied with all scrubbers. Field installation assistance is also available.